Since this month we’ve dealt with patriotism as well as pet peeves, I’d like to share what I think is a pretty cool Throwback Thursday story that can tie both together. In 1980, I was ten years old and in the sixth grade. That year, the presidential election was between Democratic President Jimmy Carter and Republican Candidate Ronald Reagan. In my Civics class, we had to draw campaign posters for our favorite candidate and write a speech that they might have used in a campaign debate. At home, my grandparents were really big into anything political as well. From the time I was old enough to crawl, Granddaddy always made me sit through the (oh, so boring!) caucuses, debates, conventions, and other such political things shown on television (not to mention making me watch the stock market report every day, but that’s another story). 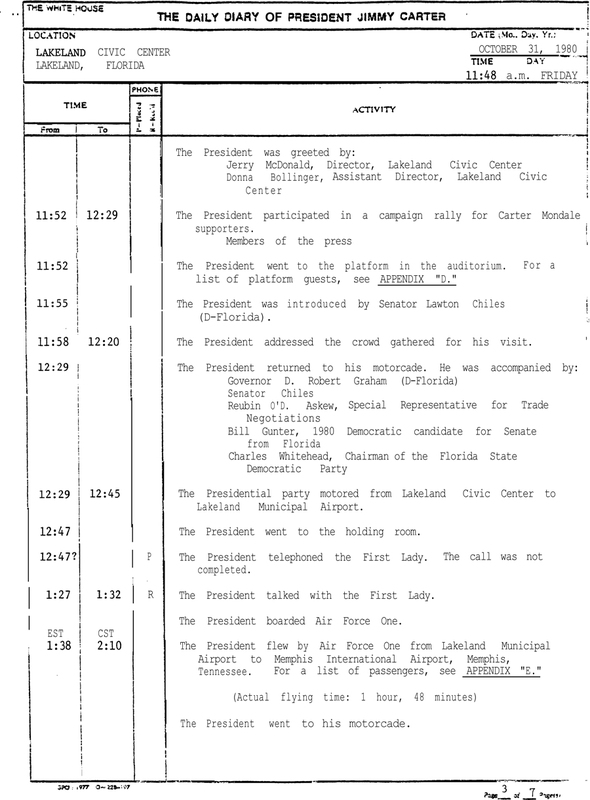 So on the campaign trail, President Jimmy Carter was scheduled to come to my town to speak. My school was on the corner of two main roads that led to the Civic Center, and back then, the newspaper always published the President’s motorcade route. So all the students of my small private school were called out of class that morning, October 31, 1980, and we lined up by the fence to wait so we could wave at the President. At the time, I was a short kid, so the two boys on either side of me told me I should climb up on the fence so I could see better. As the motorcade rounded the corner, the limo window went down, and the driver slowed. President Carter grinned and waved as he rode slowly past us, and when he saw me standing on the fence, he pointed at me. I was so excited! I went home that very night and tried to convince my grandparents to change their votes to Carter, then I sat right down and wrote President Carter a letter and asked for his autograph. 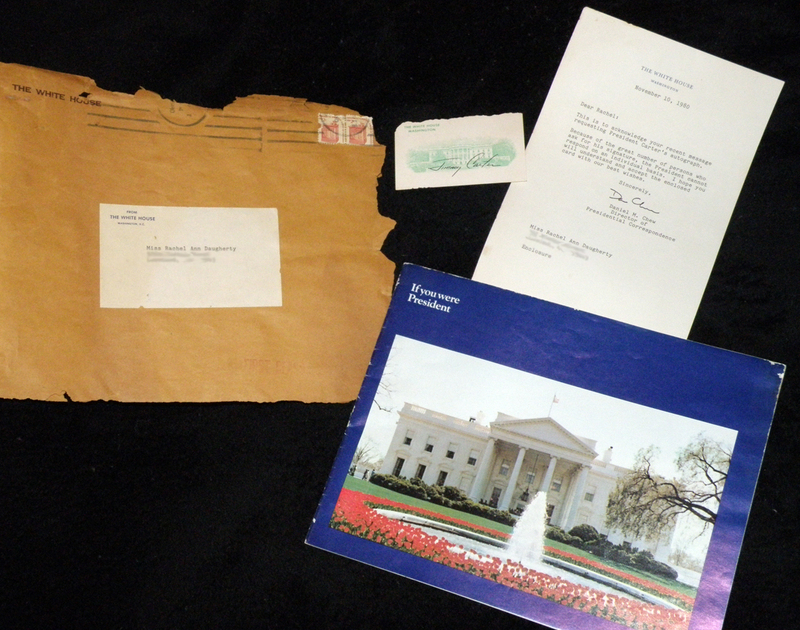 Less than two weeks later, I received a reply from The White House which said that the President was very busy and couldn’t accommodate all the people that personally asked for autographs, but they still sent me an autograph card as well as a booklet about The White House. It didn’t matter to me that the autograph wasn’t official. The man just lost an election, yet his office still had time to reply to a little girl. I was ecstatic! A couple of weeks later after I shared my story with my Great Uncle Paul (who was from also Plains, GA), he told me that he couldn’t get me the President’s autograph, but he could do the next best thing… He happened to know President Carter’s brother Billy Carter (who I think was only famous in his own right for promoting Billy Beer and for being a tippler). 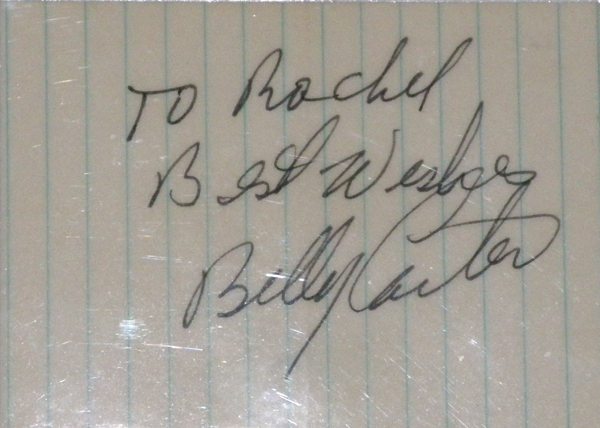 That very weekend, Billy Carter happened to be at a bar in my town (which he apparently frequented along with Uncle Paul), so I got his official autograph! Woo Hoo! Talk about thrilled! I’ve had the opportunity to meet — and even personally know — several famous people since then (mostly musicians and a couple of actors), and I’ve gotten countless autographs and even passed on the opportunities to get autographs so that I didn’t make the famous person feel like they weren’t a real person (or look uncool myself). But my Jimmy Carter “almost autograph” is still one of my most cherished. Now that I’ve covered the throwback as well as the patriotic portion of my story, let me get to the pet peeve part. I can’t stand when famous people nowadays either refuse to give autographs or will only sell them. They need to remember that without their fans, they are as much of a nobody as anyone else. Now, I don’t mean when fans try to bother them while they’re eating in a restaurant or otherwise involved in their own personal lives. But I mean, for example, if you run into one of them on an elevator. It’s not like they’re going to be doing anything else until the elevator stops anyway. And to give you a little pet peeve follow-up to my throwback, once Ronald Reagan took office as President, I wrote to him and requested his autograph as well. I didn’t even get the courtesy of a form reply from his office. I never sought a Presidential memento again. Okay, just one more quick follow-up… I also had the amazing opportunity to see former President Jimmy Carter and his wife, Rosalynn, as well as their Secret Service patrol walking around Disney World on December 31, 1999. I got one single photo of them, which of course I can’t find right now to show you. I’ll keep looking. So let me hear from you: What’s the most exciting autograph you’ve ever received? What’s your most exciting brush with a famous person? Have you ever seen a President (or your country’s leader) in person?